As a person with long standing mental health problems and struggling with a number of issues since childhood, I have always found communication difficult. In therapy or counselling, the one to one nature of some sessions was a total block on any communication between myself and the professional. In fact any sort of question in my direction caused me to lock up completely and shut down. Even in group therapy I found the same. Where …I have always found myself able to talk was where I was engaged in an activity for which there was no pressure or direct questions. For me it was a forensic psychologist who saw the way to talk to me. It was a last resort to try and pull me out of the self loathing and deep depression that threatened suicide. They asked me one day what I had been drawing. We spent an entire session not talking about my problems but about my art. The next time we carried on and suddenly I found I was talking about the stuff behind the art and the meaning of the images which was the core of my problems. This reflects the situation in S2C sessions where people suddenly find themselves open to talk about their lives and problems. We have lots of volunteers at Space2Create and of course they are there to help run sessions, clean up etc. Their main role however, is to engage in conversations and to listen. Our service Users value this time. safety and compassion that allows them to open up. The art has a role here . It forms that basis of common ground within a group and builds the group sense of belonging. Conversations begin about the art and a sense of being valued, being safe and being relevant are developed. Only then can people feel secure enough to talk, if they want to, about the issues they face. Next time I will consider the gains to be had from art participation. The artists at Green Door have very kindly invited Space2Create to be part of the yearly Art Trail this year. Artists from the Green Door group open up their studios to the public on the weekend of 28th & 29th March. 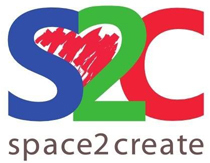 Space2Create works with vulnerable adults in Kendal using creative activity to help them as part of their recovery. At their Unit in The Factory, Space2Create runs drop in art sessions during the week as well as a photography and creative writing group. The Unit also has a gallery space where work by Space2Create service users is displayed along with exhibitions by local artists. S2C also runs sessions on Kentmere Ward at Westmorland General Hospital. Other groups working with vulnerable adults also make use of the space for sessions. 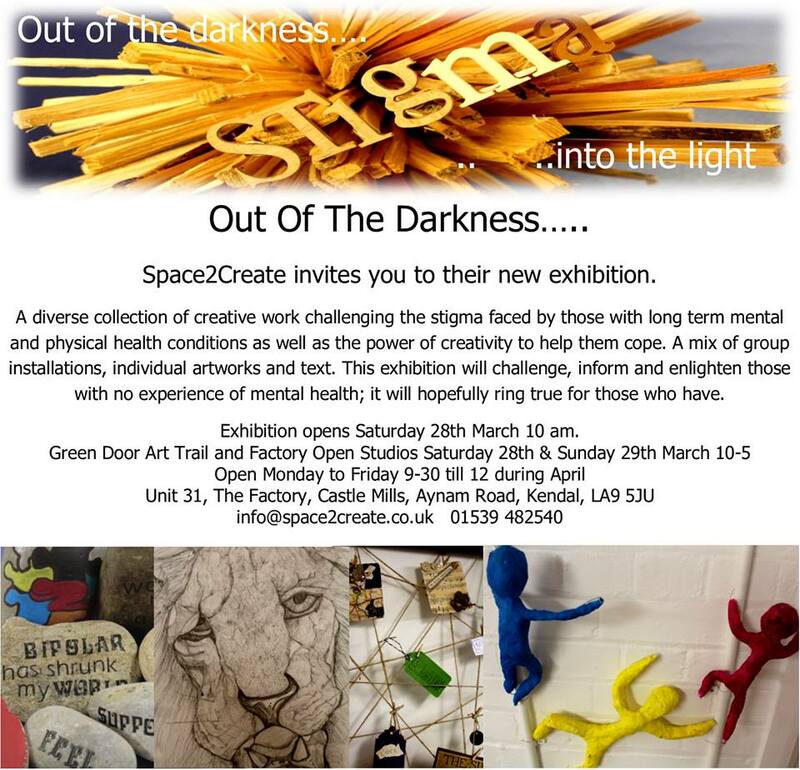 For the Art Trail Space2Create has a new exhibition, “Out of the darkness…”, which tackles issues of stigma. Visitors to the Factory will see a number of installations created by the group including a host of colourful figures leading the way to the S2C gallery along the outside of the Factory buildings. Inside the gallery work by the group is displayed in a wide range of media demonstrating the benefits of creative activity on wellbeing. The Factory artists are also having an Open Studios weekend at the same time so there is lots to see at the Factory if you visit as well as the Green Door Arts Trail. Exhibition open for Green Door Art Trail 10am to 5pm Saturday 28th and Sunday 29th March. The exhibition will continue unitl the end of May. This week has been mainly focused on getting artwork ready for our new exhibition opening on the 28th March. As deadlines draw closer there is a sudden rush of jobs that need doing and work that needs finishing. All the groups have been contributing to large scale collaborative installations all on the theme of stigma and the benefits of creativity. It should look brilliant when all set up with some outside the unit and large parts in the gallery. The 2Create group did a great job in getting ready for our next exhibition, working title being “Set us free…..”, which deals with stigma, living with serious mental and physical health conditions and being creative. Lanterns, birds, figures and string frames were all being made or finished. On the ward we created mixed-media butterflies. The techniques were easily achievable: using a piece of paper with a fold down the middle, we added differing watercolours to one side of the fold, and then folded over and pressed to create a symmetrical, colourful blot inside. We then tore round the edge of the folded base layer to make a half-butterfly shape, and unfolded. In some cases, we backed with a different paper to make our template more sturdy or attractive, and then we added various media as decoration. The results were some fantastically colourful and spring-like pieces, which one participant said brightened the room. Indeed, participants were so inspired by their creations that they then placed them as decorations on the Tree of Hope inside the ward. In the session we worked on getting items for our three installations finished. People were creating and painting birds, working on lanterns and painting modroc figures; others were creating extra items for each piece. A real team effort. With just over a week to our new exhibition opening the groups have all been working hard this week to be ready. Some of the group worked on the figures for one installation while others carried on with other projects. Debbie carried on working on her lino cut ready to print and the rest of the group created still life pictures in the style of Ben Nicholson. The panic is starting to set in as we approach the end of March for the Green Door Art Trail and Open Studios at the Factory. Getting work ready for a new exhibition is always difficult as there never seems to be a point where everything is done. Usually the last picture goes on the wall just as the doors open to let people in! We have been quite ambitious with three installations on stigma and mental health to complete as well as the fabulous artwork of our service users to frame up for display. I am sure, as always, it will look great and hopefully the message about the stigma associated with health conditions will hit home with visitors. We look forward to seeing you at Unit 31 on the 28th/29th March. This was a lovely session by Clare. Clare introduced us to the idea of reusing old frames to create string pictures with elements within them of art and collage. She linked this to the work of Kandinsky and used his style to creale smaller images which were pegged onto the string. Other mixed media elements were also added depending on the individuals choice. The finished frames could be made more personal by adding photographs or text. Ant was creating an image from a film. On the ward we created tiny models from plasticine and stuck them into a frame, which enabled us to display them in a pleasing way. Everyone made many tiny figures and replicas, whilst supporting each other with ideas and suggestions. The small size made the activity very achievable within the time constraints of the session. As one participant stated, it was a very therapeutic and soothing activity to take part in. In the session, we carried on with the installations for the Green Door Art Trail. Many of us were working on lanterns, adding words and details. Meanwhile, others in the group worked on making model birds from needle felt, or painted the modroc birds produced in previous sessions. This was a very busy and productive morning. In WellArt today we carried on the theme of last week based on the Abbot Hall Art Gallery exhibition of the Boyle family. While last week we took castings of surfaces outside thus time we created our own personal surface. First we made an outline of a shape to act as the mould. We placed items we wanted to embed in the plaster first then poured in plaster of paris. Before the plaster set we pressed in assorted items and decorations. As it hardned more we scratched in marks and added paint when it was set. Stones, Lanterns and a cast of ….well a bit of rubble! This week saw a lot of visitors to S2C and new session leaders. We always aim to make as many links to similar organisations as possible as supporting each other helps to generate success and gives us a stronger voice. It was great to see one of our service users who then became a volunteer, now having the confidence to take charge of a project and lead sessions. Not only lead the session but lead it really well. We want to see the people who come to us move forward and make positive steps to change their lives for the better and we offer a small step on the way. Our open studio sessions are proving popular, just having time to come and be creative on your own projects is really helping some people get creative. Todays session was led by Anne-Marie from the Lakeland Arts Trust. It was a great session. We started looking at the work in the current Abbot Hall Art Gallery exhibition by the Boyle Family exploring surfaces. We then set out to make casts of a surface around the Factory. This involved using wooden batons to select or frame an area of interest and fixing it with clay to seal it. We mixed up plaster and poured it in over the surface after giving it a coat of washing up liquid. After about twenty minutes we lifted these to reveal our casts. This session was run by one of our Volunteers, who has designed an installation for the group to work on, and which will then be included in the Green Door Art Trail. Part of the installation includes lanterns in different colours to represent different moods. So today, we spent the session bending willow and tying it together with wire to create a lantern shape. We then painted tissue paper with water and PVA glue, and gently stretched it over the willow to cover it. They will now dry, ready for the final decoration next session. Others in the group worked on individual pieces: knitting, drawing and model-making. A very busy and productive session. A really good, busy and positive session this morning with lots going on. The main aim of the session was to start creating the stones with positive and negative words for a large installation at the centre of our gallery on Stigma. After initially brainstormng the words we wanted to use the group used a range of methods to decorate the stones. From simply using lettraset, painting, drawing with permanent markers and collage to mixed media. Some also carried on working on our figures while Ian borrowed a camera and headed out round the Factory and up to the Helm to take pics. On the ward today we looked at patterns. We worked on a small scale, so that the images felt achievable and could be finished within the session. There is something quite therapeutic about repeating patterns, either coloured or left black and white. What we do at Space2Create, and many other art for health groups, is provide creative activity for people who are unwell. One of the big factors in the healing is the escape and distraction this provides. Art Therapy is a different approach altogether which uses art to tackle issues and allow people to express problems. At S2C we never put people in the position where they are confronted by an activity with a requirement to ch…allenge the emotions and issues they are dealing with. This does not mean they do not arise. It seems contradictory to describe the distraction of creative activity benefiting wellbeing by providing relief and escape then to look how it allows people to access and challenge issues they are facing. What I have found over many years now, is that the two do work side by side. Anyone who knows me and my artwork will know that it draws on some terrible secrets and represents difficult issues. Yet the creation of it is such a healing process. It could not be done if I was asked to confront the issues I have but by letting go and being in that creative “Zone” it unlocks the barriers and it comes out. For many people at S2C sessions they will be well served by the escape they achieve in the activities. Sometimes though, when they are relaxed, feeling safe, supported and in that creative “zone” these issues they face will come out. it might be a few simple words. It might be a whole picture. It can be a very powerfully emotional moment for them. Mostly people describe this as being very relieving and they talk about issues they have not been able to before, that have been kept back or locked away. At that moment they need the support of volunteers or indeed of the group. In part 3 I will look at the communication that is generated.